We sent our Jasmine Monroe and Austin Love to Patterson's Fruit Farm for some friendly competition. The two raced their way through the corn maze. Who won? Watch and see. Learn more about the maze here. Place your bets! 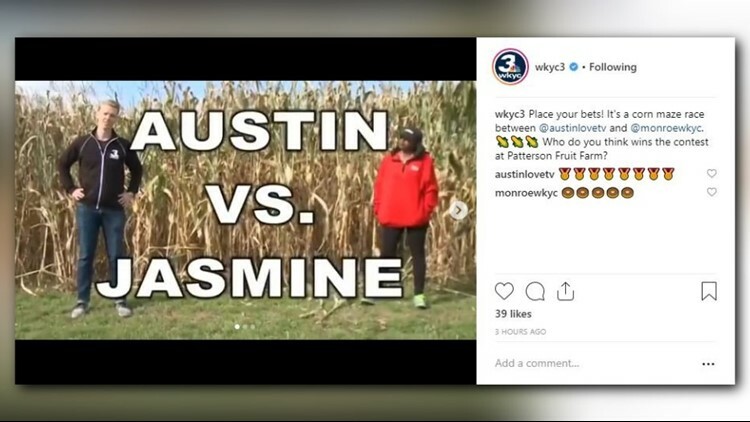 It's a corn maze race between @austinlovetv and @monroewkyc. 🌽🌽🌽 Who do you think wins the contest at Patterson Fruit Farm? Our crew spent the morning at Patterson's Fruit Farm, where our Jasmine Monroe got to make donuts. We think she did a pretty good job -- especially since she brought them back to the newsroom. Pumpkin carnage was everywhere... The annual Chagrin Falls pumpkin roll took place over Grove Hill yet again overnight. See more from the festivities here. Pumpkin carnage was everywhere... The annual Chagrin Falls pumpkin roll took over Grove Hill yet again overnight. 🎃🎃🎃 See more at WKYC.com. Yesterday, we asked for recommendations on the best hot wings in Northeast Ohio. We were curious because our new morning anchor Dave Chudowsky has a particular place for wings, which he revealed this morning. Who makes the best chicken wings in town? @davechudowsky gives that title to Close Quarters in Avon Lake. What's your pick? Can you believe Christmas is only two months away? Better get shopping soon. And don't forget about Halloween, which is just six days away. Which holiday are you most excited for? Which holiday are you most excited for?